Performance of a play by Frank Moffett Mosier, taking place in the 12th century, that concerns a visit by the Baron Paolo di Stefano to the Princess Andrina of Naples while her husband is away fighting the Turks, and gives a wry look at the medieval ideal of courtly love. The cast includes Linda Phillips as Andrina, Eugenie Snell as Francesca, Bill Wiley as Giovanni and Joseph M. Hamer as Paolo. Original music composed and performed by Marilyn Scheuer. Technical direction by fred Friedman. Directed for the Mind's Eye Theatre by Sarah Schilling. 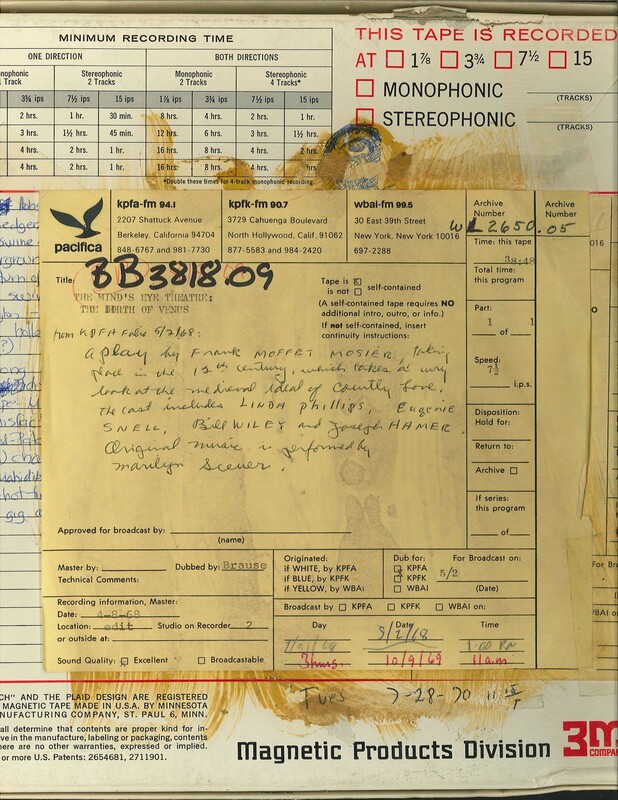 This recording was formerly cataloged as BB3818.09. WBAI, 2 May 1968. First WBAI broadcast, 12 April 1968. 1 reel (39 min.) : 7 1/2 ips, mono.